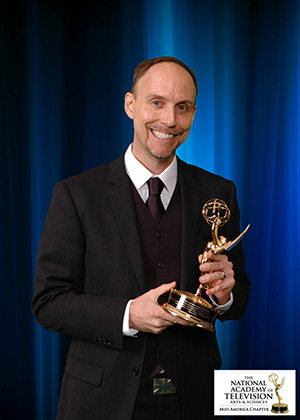 Congratulations to Beckman Video Producer Steve Drake on his Mid-America Emmy win for "Why Men are Better Navigators than Women," which features the research of Beckman full-time faculty member Justin Rhodes. Steve Drake, video producer for the Beckman Institute, is on a winning streak. Drake was honored with a Mid-America Emmy Award for the third year in a row on Saturday night for his video, “Why Men Are Better Navigators than Women: Adaptation or Testosterone Side Effect.” The video won in the Informational/Instructional-Feature Segment category, and was awarded at the 37th Annual Mid-America Emmy Awards in St. Louis, Missouri. This latest Emmy winning video highlights the work of Beckman neuroscientist and evolutionary biologist Justin Rhodes. In it, Rhodes disputes the long-held theory that males are slightly better navigators than females because of the division of labor in early human hunter-gatherer societies. Rhodes and his team developed a way to put this evolutionary theory to the test. Eschewing a purely academic presentation of the material, the video presents Rhodes’ evidence in a lighthearted way, with the help of animated cartoon cavemen, cavewomen, and a rambunctious woolly mammoth. The video was a coproduction with the Illinois News Bureau, with life sciences editor Diana Yates acting as the associate producer on the project. Drake’s previous regional Emmy winning videos were 2011’s “The Invisible Gorilla,” which featured psychology professor Dan Simons and a video confessional by the under-appreciated gorilla, and 2012’s “Sculpting Proteins,” which highlighted the collaboration between artist Julian Voss-Andreae, DePauw University, and Beckman’s Klaus Schulten’s in creating a series of huge sculptures based on Schulten’s protein folding visualizations. All of the videos created by the Beckman Institute are available online.